Can energy-efficient buildings make you sick? The wheels of justice ground to a halt at the Alberta Court of Appeal in Calgary in 2001. Housed in an 87-year-old sandstone building -- the oldest surviving courthouse in the city -- several judges, attorneys and minions of law suffered fatigue, irritated lungs and watery eyes following a renovation to bring the historic structure up to modern efficiency standards. "They couldn't figure out what was wrong," said Tang Lee, a professor of architecture in the Faculty of Environmental Design at the University of Calgary. The chief justice asked Lee to investigate the problem. "Within a couple weeks, we shut down the whole courthouse," Lee said. It turned out the upgrades had a downside: Filling in the cracks and gaps in the leaky old building helped cut energy costs but also trapped humidity inside that would otherwise have dried out in drafty air. Without adequate vapor barriers and ventilation, a toxic blend of mold grew in the walls, according to Lee's air-quality samples. 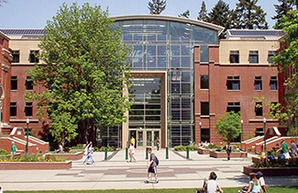 Parts of Lillis Hall at the University of Oregon were used as a laboratory to study concentrations of bacteria in buildings. Photo courtesy of the University of Oregon. Despite a multimillion-dollar remediation effort, the building still sits idle since the Court of Appeal moved to the TransCanada Pipelines Tower in downtown Calgary. Mold still lingers in paper court documents, requiring someone with a respirator to retrieve and scan contaminated files to send to officials as requested. "It's a beautiful renovation," Lee lamented, adding that the situation is a stark reminder that even in pursuit of saving energy, human health is a paramount concern in designing and retrofitting the enclosed spaces where people spend most of their lives. "It's not just making it look pretty, and it's not just making it more efficient." This is a growing issue as architects try to make homes, offices and factories use less water and energy. Buildings are an especially important target, since they account for 39 percent of greenhouse gas emissions in the United States, according to the U.S. Green Building Council. In addition, the majority of structures standing now will still operate in 50 years, so retrofits will be a big part of the solution to climate change. "The building stock we have is obsolete, so we have to do it," Lee said. "We can retrofit it as long as we understand the building science." However, when it comes to human exposure to indoor microbes, there isn't much data to work with. "It's pretty much a brand-new field," said James Meadow, a postdoctoral researcher at the Biology and the Built Environment Center at the University of Oregon. "In the past few years, it's pretty much exploded." In a study published last month in the journal PLOS ONE, Meadow and his colleagues went on a bacterial safari inside one of the University of Oregon's most efficient buildings, Lillis Hall. It's part of the Lillis Building Complex, a $41 million, four-story, 196,500-square-foot multipurpose building completed in 2003 that stands in Eugene, Ore., which has a temperate climate year-round. About half of Lillis Hall's offices use natural ventilation and open windows, while the other half use forced-air heating and cooling. The complex earned a Silver Leadership in Energy and Environmental Design (LEED) certification. "In this paper, we sterilized little shop vacs and fitted them with special filters and vacuumed up dust," Meadow said. The team then sequenced DNA chunks from the bacteria they unearthed to find out where certain species lived. They found that the building was a bacterial zoo, but that different areas -- like hallways, offices, classrooms and auditoriums -- housed different exhibits. Meadows said this was because the spaces are unique environments, each seeded with its own microbes. "Two offices right across the hallway from each other actually look very different from each other microbiologically because they are bringing in different air," Meadow said. People also use the spaces differently, with students tracking in bacteria that live in soil to classrooms, dust-borne germs settling in utility rooms and humidity-loving organisms from the digestive tract taking root in bathrooms. "We leave behind a human signal very obviously in bathrooms," Meadow said. "But when you leave that aside, the function of a room has a lot to do with what you find there." But don't reach for the bleach just yet. "Most of the bacteria we come into contact with are really good for us," he added. "The prevailing wisdom has been 'We just want to sterilize everywhere we are in.' When you sterilize something, you are just making room for something else to come in." Instead, architects need to rethink their priorities in designing or retrofitting buildings in order to hit the right balance of health and efficiency. Richard Corsi, a professor in the Department of Civil, Architectural and Environmental Engineering at the University of Texas, Austin, suggested that architects should aim higher than the lowest common denominator when it comes to the health of buildings. "Traditionally, buildings have been designed to be what most people characterize as 'acceptable to 80 percent of the occupants of the building,'" he said. "It's historically based on perceptions of people in buildings rather than the reality." However, attaching numbers to health is tricky compared to monitoring electricity use or water consumption in a structure. Indoor air quality, for example, changes dramatically from room to room, shifting based on how air circulates and how people use the area. Air-quality monitoring devices are also expensive, and it's difficult to predict which parts of a building may pose the greatest health risks. Asking the people using the building about their health may not tell the whole story, either, since occupants have varying tolerances for dust, mold and bacteria. Other indoor hazards, like volatile organic compounds that emanate from certain paints and fixtures, are difficult to detect and may not present health problems for a long time. In addition, the business case for health-conscious upgrades is a tougher sell for landlords and operators compared to saving money from energy efficiency. Corsi said there are ways to improve health and energy efficiency in buildings. "You can have a tight building that's still well-ventilated," he said. Selecting appropriate materials that don't give off harmful fumes or play host to nasty mold and bacteria is also a viable strategy. Creating regulations and industry standards are another crucial component of improving indoor health. U.S. EPA issued guidelines in 2011 for maintaining clean air indoors during home energy efficiency upgrades. "There's no technological hurdle to doing it," Corsi said. "The U.S. Green Building Council has done a remarkable job of marketing green buildings. The indoor air quality component of LEED, in my opinion, is not very strong." The University of Calgary's Lee agreed that stronger health rules would force architects to make it a priority. "I would love to see regulation, but that's going to be a tough road," he said. "What good is a beautifully designed building that wins all kinds of design awards if the people inside are sick?"